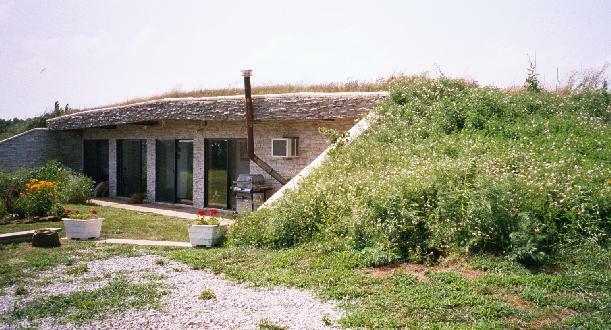 Yes, that's grass growing on the roof. The home has five, eight foot wide sliding doors that let in plenty of sunshine and natural light during all seasons. In the winter months, when the sun shines, the southern exposure provides all the solar gain necessary to heat the home! The wood stove is only necessary as a backup for heat on cloudy days. As the sun hits the concrete floor, it warms the slab. which acts as a heatsink; the warmth radiating back into the insulated environment when the sun goes down. The view of the garden and surrounding woods offers glimpses of abundant wild life. Deer and wild turkey feed in the cover of the nearby trees. There are neighborly coyotes, snakes, skunks, racoons, rabbits, voles and squirrels to keep one company. We have cardinals, bluebirds and a grand population of barn swallows to eat the armies of insects that sometimes threaten us. Crown vetch is planted on the sides and back of the house and makes a carefree exterior landscape. Jerusalem Artichokes are planted along the patio for shade as well as part of the edible landscaping. Herbs are grown in the flowerbed near the kitchen and are a tasty addition to the summer harvest of vegetables. The root cellar provides cool storage for the root crop vegetables grown in the early spring garden. Potatoes, carrots and cabbage benefit from the underground storage area just a few steps from the kitchen door. 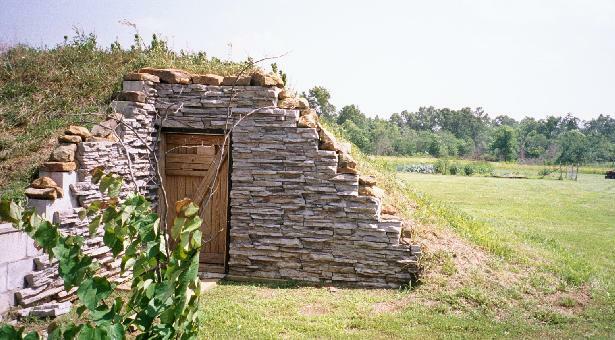 The root cellar also can serve as an emergency storm shelter, although the home itself has already withstood the full impact of a small tornado, which hit us the spring after it was built. It came through the ordeal with zero damage, even though a mobile home adjacent was totally destroyed and the chicken coop was turned upside down, much to the dismay of the hens.